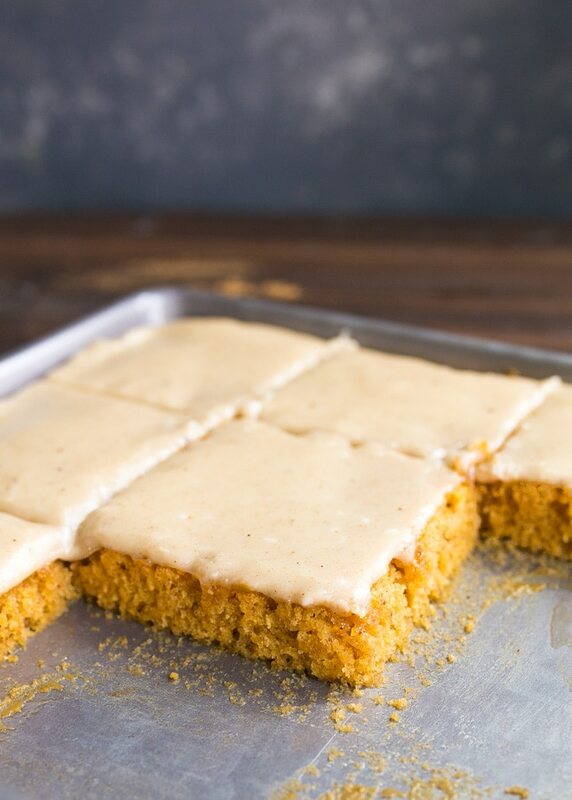 Pumpkin sheet cake made in a quarter sheet cake pan. Topped with the best pumpkin spice frosting made on the stove! I always hesitate before sharing my quarter sheet cake recipes, because they clearly serve more than two. However, a quarter sheet cake recipe makes significantly less cake than a standard giant sheet cake, so I think we’re good. My goal is smaller desserts and less desserts, not just two single pieces of dessert, you know? I hope you’re with me! Have you seen my Texas Chocolate Quarter Sheet Cake? We absolutely love it, and bake it often. I included a White Texas Sheet Cake recipe in my 3rd cookbook, Sweet & Simple: Dessert for Two. 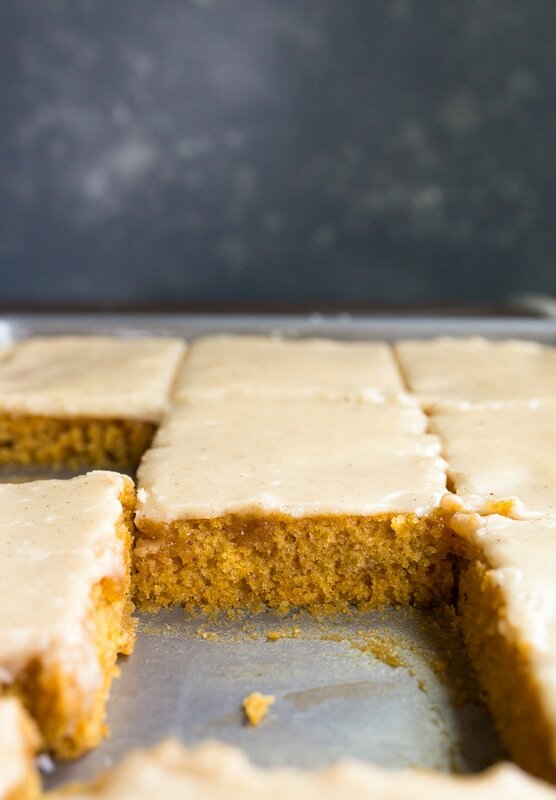 It’s time for the pumpkin sheet cake version! First, I feel like I should really say THANK YOU. There was a time in my life when I didn’t like pumpkin. It had to do with an incident in college with raw pumpkin, and I avoided pumpkin for years afterwards. However, over the 8 years of writing this blog, I always make an effort to include a few pumpkin recipes for you each year. Slowly, over time, I’ve started to actually like pumpkin–all thanks to you! Oops, I think I listed nearly all of them. 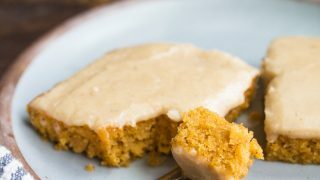 The point is, a lot of recipes have come before this one that makes me finally ready to appreciate a real pumpkin cake! 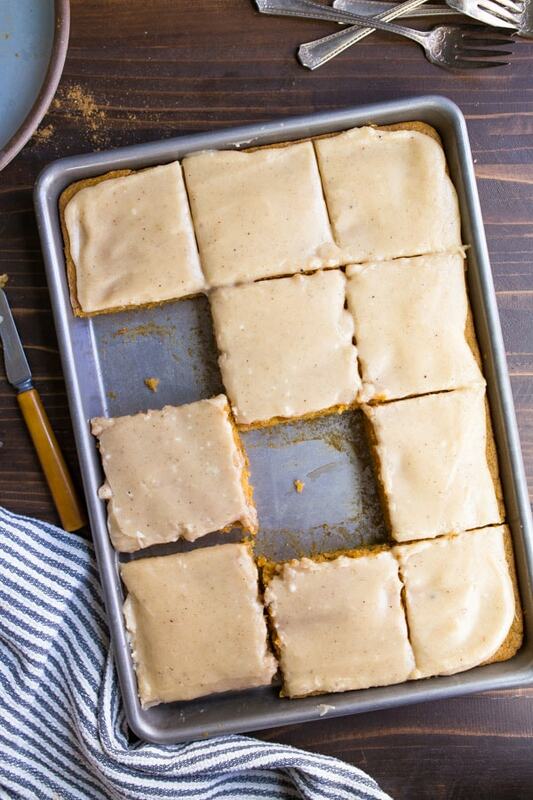 A pumpkin Sheet Cake with pumpkin spice frosting! The pumpkin recipes I’ve shared so far on this site are so good that I don’t even mind that they contain pumpkin. While you’ll never catch me gobbling up a plain piece of pumpkin pie, you can occasionally find me reaching for my Orange Spiced Coconut Pumpkin Pie. Overtime, I’ve noticed that I’ve become more okay with pumpkin. It started slowly with my homemade pumpkin spice latte (naturally), and it stayed that way for years. But this year, I think I’m ready for more vegan pumpkin muffins! Pumpkin sheet cake! And all the pumpkin desserts for two! We’ve come a very long way, friends. Thanks for being patient with me, and teaching me to love pumpkin, even if I only love it with gobs of sugar and spices, I appreciate you. I dedicate this pumpkin quarter sheet cake to you! I’m so glad you asked! The quarter sheet cake pan that I use measures roughly 9″ x 13″ x 1″. This is the exact pan that I use. I own two, and I use them frequently for roasting small batches of vegetables. If you glimpse at the photo, you can see that you get 12 small pieces of cake from this pumpkin sheet cake recipe. I would bake a quarter sheet cake for a dinner party of 4 to 6 people. You might not have any leftover, but no one will miss dessert either! 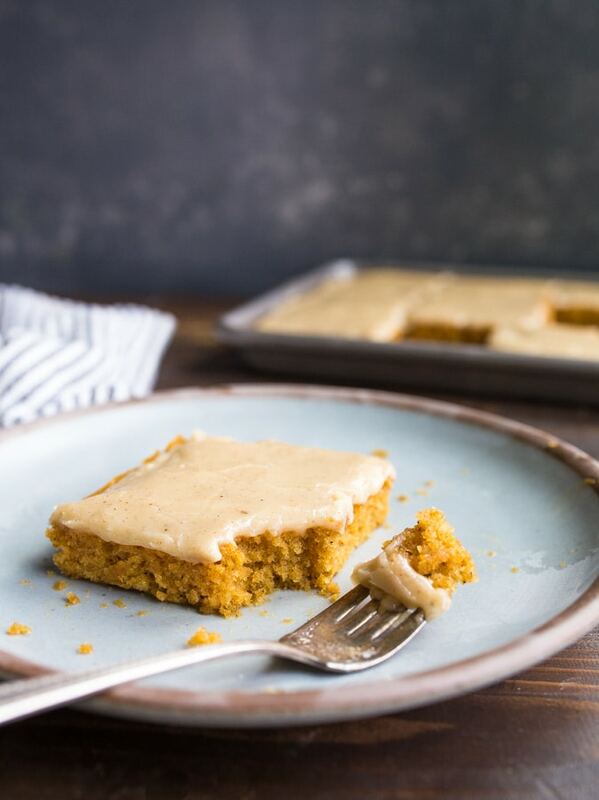 This pumpkin sheet cake recipe uses just 3/4 cup of pumpkin, leaving you with one full cup leftover from the can with which to bake another pumpkin dessert for two. You’ll also have al leftover egg yolk, as this recipe only uses the egg white. Browse my recipes that use egg yolks only. 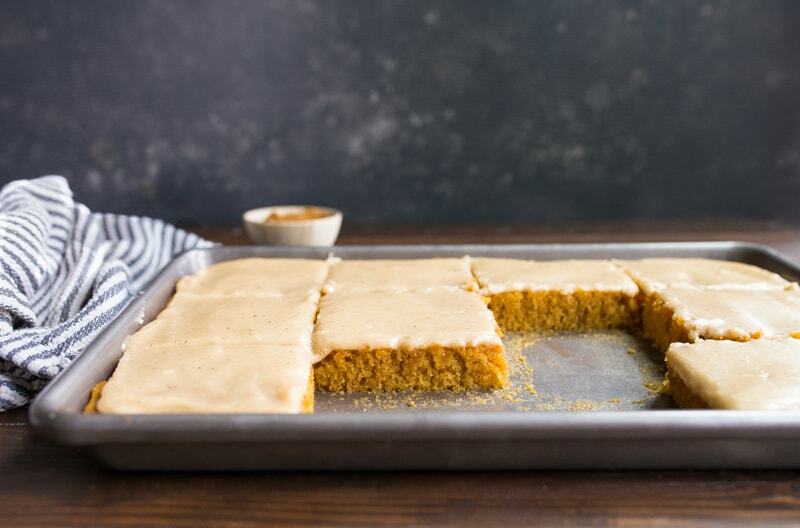 I hope you enjoy this pumpkin sheet cake, but I really hope you enjoy the pumpkin spice frosting! I like to make my own pumpkin spice mix (1 tablespoon cinnamon, 2 teaspoon ground ginger, 1 teaspoon nutmeg, 1/2 teaspoon ground cloves, 1/2 teaspoon ground allspice, and 1/2 teaspoon finely ground black pepper), and use it here. While you’re making the frosting on the stovetop, it’s an excellent time to practice your browned butter skills! Since the butter melts alone before any other ingredients are added, go ahead and practice browning it. If at any point you get scared you’re going to burn it, just add the milk and powdered sugar and continue! It’s like an optional browned butter frosting situation here, friends. It’s excellent with browned butter, but it’s amazing without it, too. 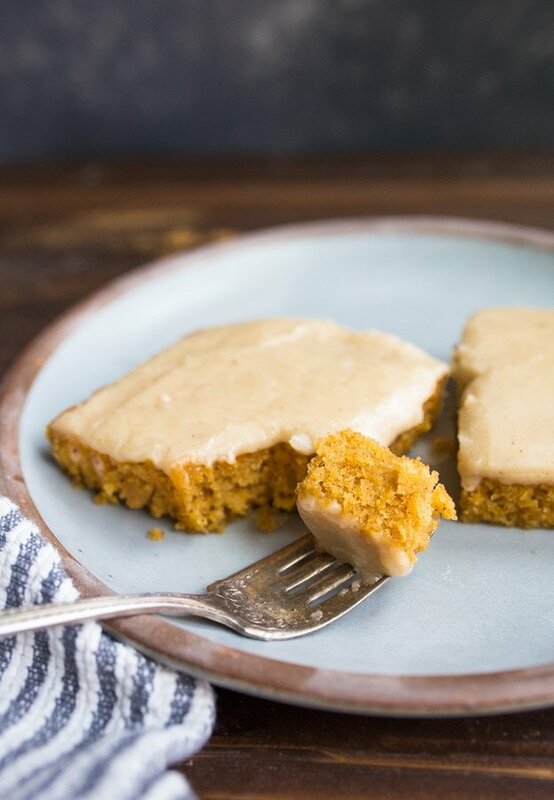 One bowl pumpkin sheet cake with pumpkin spice frosting. In a separate bowl, whisk together the melted butter, buttermilk, egg white, pumpkin, baking soda and pumpkin pie spice. Mix very well. Pour the pumpkin mixture into the bowl with the flour, and stir until everything is combined. Pour the batter into the prepared pan and bake for 16-18 minutes, or until a toothpick inserted comes out clean. While the cake cools, make the frosting: in a small sauce pan, melt the butter over medium heat. You can brown the butter if you like. Whisk in the buttermilk and powdered sugar. Add the pumpkin spice last, and whisk very well to combine. Pour the warm frosting over the cake, let rest for about 15 minutes (or longer) before slicing and serving. *To make your own pumpkin pie spice, mix 1 tablespoon of ground cinnamon, 2 teaspoons ground ginger, 1 teaspoon ground nutmeg, 1/2 teaspoon allspice, 1/2 teaspoon cloves, and 1/2 teaspoon finely ground black pepper. This recipe looks so yummy! I noticed buttermilk on the ingredient list. I’m wondering if you use real buttermilk or if you make your own with the vinegar and milk trick? Whenever I purchase buttermilk for a recipe most of it just goes to waste. I freeze leftover buttermilk in small jars. When I take one out to defrost for a recipe, I often find that it has separated into the solids and a watery base. No worries, give it shake and measure out what you need. It works in all my baking recipes. If any of the defrosted buttermik is left, I toss it. I’m not a fan of pumpkin pie either. Still not. But I made your Mini Pumpkin Cakes yesterday and man they were delicious. And with the egg white I made your Forgotten Cookies. Going to try this quarter sheet cake next. This icing looks amazing. Thanks for sharing everything you do. Why not use one whole egg instead of just the white I’m curious. It’s just part of the scaling down process, Pat. Usually, I pick between an egg yolk and egg white, depending on what I need–moisture (yolk) or fluff (white). Since this site has all small-batch recipes, I would recommend following the recipes and not plopping in the whole egg when it isn’t called for. It will throw things off. best of luck! Quick question … does the pan have to be 1” deep? Does 5/8” work? Thanks for the recipe. Looks delish! I just made this for Canadian Thanksgiving and oh my goodness! It is fantastic. I let the butter brown and it makes the icing very caramel-like. I also used salted butter as it was all I had on had and it was then like a salted caramel. What a winner – so easy and quick and a crowd pleaser! Thank you – this will be a new thanksgiving tradition for us! To answer your question, pumpkin purée is cooked pumpkin that is usually roasted in the oven and then placed into a blender or food processor to purée it. If you cannot find that canned in India, you can make your own pumpkin purée (or you can substitute any similar squash such as kabocha squash – which I had done before). All you do is simply cut the squash in half, scoop out all the seeds, season it with a little salt and coconut oil, and roast the squash in the oven with the skin on at 350 to 375 deg F (depending on size and on your oven, smaller ones may only need 30 minutes; whereas large ones may need 45 mins to 1 hour). When it cooled down a bit the flesh will just slide right off and then you can purée it. If there are leftover purée pumpkin, you can always save it in the fridge for later use. I hope this helps. I’m waiting for this to come out of the oven right now. So excited! Late update to my first comment. This pumpkin cake was very good. My family loved it! Made this last night and it was an absolute hit. It was incredibly moist. The only thing I added was a bit of cream cheese to the frosting, because I love everything cream cheese. I can’t wait to make it again! Thank you for the delicious recipe! It’s delicious! Great fall recipe. How do you think a little rum flavoring would taste? Either in the cake or the frosting? I’m thinking frosting but would like your opinion. I made this cake last night!! So moist and delicious. Love not having to drag out my Kitchenaid mixer to make a cake. Browning the butter (I used salted) takes the frosting to another level, tastes like a salted caramel frosing. Thanks for a great recipe that I’m sure I’ll be making all season long. I’m not a huge pumpkin fan but since everyone else seems to love it I tried this. OMG this is insanely good. It was so quick and easy to make and browning the butter brought this to a whole other level. Although to be honest the cake could stand alone if you wanted a snacking cake. Thanks! This cake is really good, and the frosting is wonderful. Thanks for the mix for pumpkin pie spice. I never buy it because I don’t like the clove. I just left it out of the mix. Wondering if I can use glass 13×9 pan??? My 1/4 sheet pan is not 1″ deep?????????? Hmmm…you can try. I haven’t tried that, and sometimes, the extra height from a pan can radiate extra heat and make a cake sink. But it’s worth a shot.